The consequence of success is a massive target on your back. This has never been more apparent than in the electric vehicle space, because the industry leader — Tesla — has more heat on its tail than a Spitfire during the Battle of Britain. From Lucid Motors to Porsche to Chevrolet, everyone wants to take Tesla’s spot at the top, but few brands are making bigger waves than Faraday Future. At CES 2017, the brand made its biggest wave yet. The Chinese-backed, California-based startup has officially revealed its first pre-production vehicle, and it’s called the FF 91. With unprecedented connectivity and capability, the aerodynamic crossover looks to change the way we look at mobility. And although it isn’t quite the jaw-dropper the FFZero1 concept was, the car should give Elon Musk plenty of reasons to lay awake at night. One reason is simple — performance. The FF 91 is powered by a massive 130kW battery pack that produces a whopping 1,050 horsepower and provides up 378 miles of driving range. For reference, the range-topping Model S P100D offers a 100kW battery pack with 315 miles of range. Faraday’s incredible powertrain gives the FF 91 a 0 to 60 mph time of 2.39 seconds, which is faster than any Tesla, any production Ferrari, and most sport bikes. That’s not ludicrous, that’s downright unbelievable. So yes, the car is fast, but that’s only part of the FF 91’s story. Faraday says the crossover is “the world’s first ecosystem connected car,” meaning it links to all your mobile devices and can stream incredible amounts of data to its HD screens through a dual antenna WiFi system. That essentially makes the car a rolling hot spot. Occupants will have plenty of time to navigate the digital world inside the car, because the FF 91 is predictably packed with autonomous features. It wears a dynamic sensor system that would make the USS Enterprise jealous, with 10 cameras, 13 radar sensors, one 3D lidar sensor, and 12 ultrasonic sensors in total. 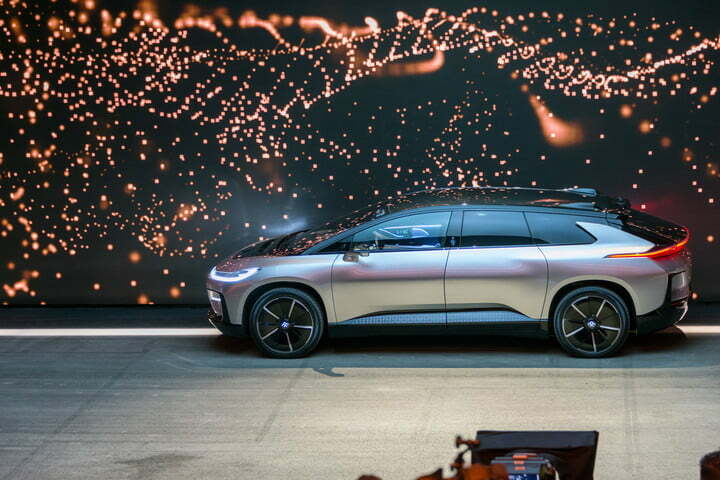 With these systems working together, the FF 91 can drive and even park itself, although the system admittedly had a few issues during Faraday’s live demonstration. Just how much will the FF 91 cost? According to a report by Reuters citing former executives, the FF 91 will sell for anywhere between $150,000 and $200,000 when it goes on sale in 2018. Interested parties can go to Faraday’s website, register a unique FFID, and plop down a refundable $5,000 deposit to reserve theirs. The FF 91 is undoubtedly big news, but Faraday Future wants to prove it isn’t just a flash in the EV pan. The manufacturer’s Variable Platform Architecture is modular, so by adding or removing “strings” of batteries from the vehicle floor, the brand can produce automobiles of varying size and character. Tack on more strings, and you have a battery-powered SUV akin to Tesla’s Model X. Remove them, and you’ll have a smaller hatchback or sports car, with front-, rear-, and all-wheel drive configurations available. Eventually, the brand hopes to release smaller, more affordable cars that will compete directly with Tesla, but for now, Faraday is aiming for a demographic well above anything Elon Musk and Co. currently produce.